Since releasing her debut record, “Passing Thru”, in 2004 Audrey’s been on the road touring both solo and with a band. She’s just finished her second full length record “Dishes & Pills” which will be released by Folkwit Records in the UK this fall. Her music started out in the jazz/pop vein and has evolved into an eclectic form of singer-songwriter indie rock of some alien breed using backwards loops, finger pianos, and other un...ique instrumentation. 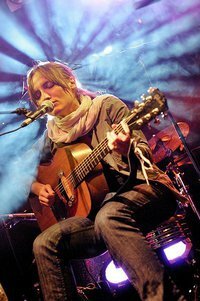 Overall this music blends together her early influences of Neil Young, Joni Mitchell, and Bob Dylan with contemporaries such as Robert Wyatt, Radiohead, Dungen, Wilco, Steroelab, and Arcade Fire. She performs nationally and internationally and reside on the east coast.